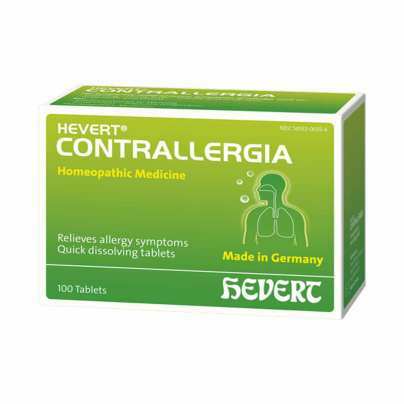 With Hevert Allergy Relief you chose a proven homeopathic medicine. Its active ingredients are generally well tolerated and provide effective relief of the symptoms of allergy. This medicine is also suitable for children aged 6 years and over. As with other allergic symptoms, allergic symptoms of the respiratory tract are an overreaction by the body to certain foreign particles called allergens. These include pollen, mold spores or proteins that adhere to animal hairs and dust. The symptoms of hay fever are not limited to the nose, where frequent sneezing, swelling of the nasal mucosa and runny nose predominate. In addition, the eyes get watery, burning and red. The eyes as well as the entire nose and throat area can become annoyingly itchy. The most common type of allergic rhinitis is hay fever, also known in medicine as pollinosis. Millions of people in the United States get hay fever. Everyone has their own individual allergy season, depending on whether they react allergically to early flowering trees, weeds and shrubs in early summer or to grasses and grains in summer. -Adults and children over 12 years of age: Dissolve 2 tablets in mouth 3 times daily. In acute cases, dissolve 2 tablets in mouth 6 times daily. -Children 6 to 12 years of age: Dissolve 1 tablet in mouth 3 times daily. In acute cases, dissolve 1 tablet in mouth 6 times daily.